Freckles to Toes: Do You Use Different Oils for Different Parts of Your Face? I've always used my flavor of the month bottle of oil all over my face. Sometimes I'd throw a little more at drier spots, but otherwise I didn't mix it up. After stumbling upon some specialized oils, I realized that one oil might be perfect for acne prone areas, and another best for dry/rosacea/oily/sensitive etc. regions. Most people have combination skin, like an oily t-zone, so specialized oils for problem areas could be a perfect remedy. I decided to try Marie Veronique's Treatment Oil on my acne prone chin, while using my tried and true Kahina on the rest of my face. It's been a very long trial period, (I had to put it through it's paces) but I'm happy to say that after four months I haven't had a single breakout on my chin. I don't know about you, but for me, that's a feat. Nothing else has quelled the cystic acne that pops up there so successfully. I don't think I'll ever go without this bottle again (and a travel size). Holy grail status. 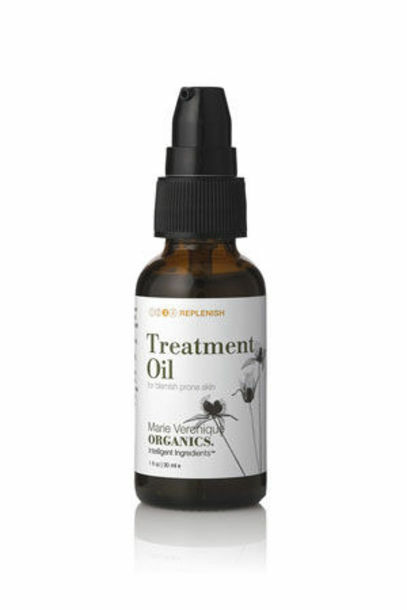 The Treatment Oil uses lavender, tea tree and rosemary essential oils because they are strong antibacterials and therefore powerful acne fighters. Marie has added black willow bark to also decongest pores. Tamanu oil is a smart addition for it's antibacterial, antimicrobial and antifungal properties. Bonus: it's also been shown to treat burns. Chamomile is included for it's well known anti-inflammatory qualities. Borage and pumpkin seed oils are present to soothe the skin. This isn't the kind of treatment that will dry out or irritate your skin, and it won't even bleach your towels. The bottle may seem a tad expensive, (understatement of the year award) but after four months of religious everyday use, my bottle is only empty in the neck. The entire body of the bottle is still full. A little goes a long way with this powerful oil, and the price per use is completely reasonable. What have you tried for your cystic acne? I sought out this product, received a free sample courtesy of Marie Veronique Organics, and was not compensated monetarily or otherwise for this post. Great minds think alike! I've been applying different oils to my hormonal breakout areas on lower cheeks and chin (not cystic but still not fun). It's working very well! I'm using Annmarie Gianni Herbal Facial Oil for Acne (will review over on NMDL soon). Love. I haven't tried that oil! It looks great, and it has lots of similar ingredients: willow bark, red raspberry oil, cranberry oil and carrot oil. But I like the addition of neem! How's it smell? Kinda spicy and fresh, very gender-neutral. At first I thought it was weird smelling - not bad, just odd - but it's grown on me and I like it now. Oh good! Glad the neem isn't too overpowering.